The blue and white flag of the UN consists of the two olive branches encasing a picture of the world. The olive branches and map are in white where as the rest of the flag is blue. The two olive branches represent peace and the map represents the countries of the world. The emblem therefore stands for peace between nations. 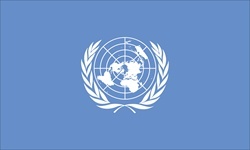 The flag was first officially attached to flag poles on October 20, 1947, and consists of the official emblem of the UN in white on a blue background. The emblem's design is described as: The blue color that appears in the background of the insignia was chosen to be the opposite of red, which is the color of war and death. The exact shade of blue that is used has never been officially specified by the United Nations, The original color that was chosen in 1945 was a gray blue that is different from the current United Nations flag. The globe used in the original design was an view from the North Pole down. The projection used cut off portions of the Southern Hemisphere at the latitude of Argentina, which, was acceptable at the time, as Argentina was not planned to be an original member of the United Nations. The Olive branches are symbol of peace, and the world map represents all the people of the world. White and blue are the official colors of the UN so the decided for them to be used in the flag. The United Nations flag may also be flown from international flag poles as a garrison flag with other country flags. Garrison size is 10 by 30 feet.